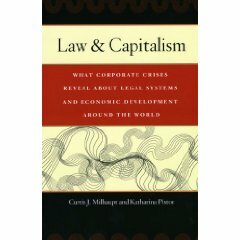 Curtis J. Milhaupt, Katharina Pistor, Law and capitalism: what corporate crises reveal about legal systems and economic development around the world, University of Chicago Press, 2008. This text sets forth a new analytic framework for understanding the problems inherent in legal regulation of business practices in capitalist economies. The authors question the view that law is an instrumental function for financial market development and economic growth. They argue that law and markets evolve together in a “rolling relationship,” and legal systems, including those of the most successful economies, therefore differ significantly in their organizational characteristics. 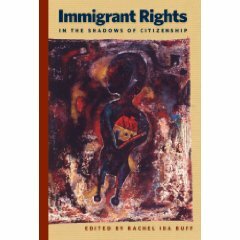 Rachel Ida Buff, ed., Immigrant rights in the shadows of citizenship, New York University Press, c2008. Prominent activists and scholars examine the emergence and significance of the contemporary immigrant rights movement. The book places the contemporary immigrant rights movement in historical and comparative contexts by looking at the ways immigrants and their allies have staked claims to rights in the past, and by examining movements based in different communities around the United States. George A. Bermann, Charles H. Koch, Jr. and James T. O'Reilly, Administrative law of the European Union: Introduction, ABA Section of Administrative Law and Regulatory Practice, c2008. Cynthia R. Farina, Sindey A. Shapiro and Thomas M. Susman George A. Bermann, Charles H. Koch, Jr. and James T. O'Reilly, eds., Administrative law of the European Union: Transparency and data protection, ABA Section of Administrative Law and Regulatory Practice, c2008. Peter L. Strauss, Turner T. Smith, Jr. and Lucas Bergkamp George A. Bermann, Charles H. Koch, Jr. and Jame T. O'Reilly, eds., Administrative law of the European Union: Rulemaking, ABA Section of Administrative Law and Regulatory Practice, c2008. Michael Asimow and Lisl J. Dunlop George A. Bermann, Charles H. Koch, Jr. and James T. O'Reilly, eds., Administrative law of the European Union: Adjudication, ABA Section of Administrative Law and Regulatory Practice, c2008. Ronald M. Levin, Frank Emmert and Christoph T. Feddersen George A. Bermann, Charles H. Koch, Jr. and James T. O'Reilly, eds., Administrative law of the European Union: Judicial review, ABA Section of Administrative Law and Regulatory Practice, c2008. Donald P. Wilcox, Transitions: legal considerations in selling or closing a medical practice, Texas Medical Association, c2007. Multilateral treaty framework: an invitation to universal participation: 2008 treaty event: towards universal participation and implementation: dignity and justice for all of us, United Nations, 2008. Curtis J. Milhaupt, Katharina Pistor Law and capitalism: what corporate crises reveal about legal systems and economic development around the world, University of Chicago Press, 2008. Jonathan Rothchild, Matthew Myer Boulton and Kevin Jung, eds., Doing justice to mercy: religion, law, and criminal justice, University of Virginia Press, 2007. Nancy P. Johnson, Susan T. Phillips, Legal research exercises, following the Bluebook: a uniform system of citation, 10th ed., Thomson West, 2008. Ecosystem approaches and oceans: panel presentations during the United Nations Open-ended Informal Consultive Process on Oceans and the Law of the Sea (Consultive Process), Seventh meeting, United Nations Headquarters, New York, 12 to 16 June 2006. United Nations, c2008. Eliminating and recovering improper payments. Evaluating the progress and identifying obstacles in improving the federal government's security clearance process. Federal government's role in empowering Americans to make informed financial decisions. Foreclosures at the front step of the Federal Reserve Bank of Cleveland. Hearing on the use of robocalls in federal campaigns. Human capital needs of the U.S. Customs and Border Protection One Face at the Border initiative. Improving federal financial management: progress made and the challenges ahead. Iraq reconstruction: an overview: hearing before the Committee on Oversight and Government Reform, House of Representatives, One Hundred Tenth Congress, first session, February 15, 2007. Is this any way to treat our troops? : the care and conditions of wounded soldiers at Walter Reed. Not a matter of if, but of when: the status of U.S. response following an RDD attack. Oversight hearing on election day registration and provisional voting. Perchlorate: health and environmental impacts of unregulated exposure. The Leegin decision: the end of the consumer discounts or good antitrust policy? The road ahead: implementing postal reform.